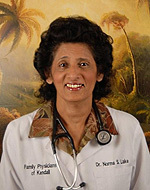 Dr. Lake is board-certified in family medicine and has practice experience of over 20 years. As a family practitioner, Dr. Lake can serve as primary care physician for people of all ages, as well as provide consultation for other physicians. Family medicine physicians, also called family practice physicians or family physicians, are medical doctors who specialize in providing continuing, comprehensive health care for the individual and the family, including physical and behavioral health.